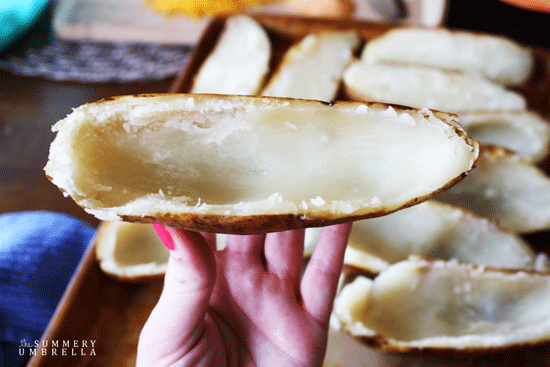 Today I am sharing a Velvety Twice Baked Potato recipe that is not my creation, but it is scrumptious! 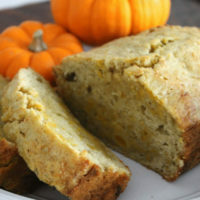 I made it for the first time this past Thanksgiving after seeing it made on a Food Network show… my entire family LOVED it!! At that time, all I had were small potatoes in my pantry so I made it with those; it was not easy. The shell was naturally thinner and tore easily. This time, I followed the recipe and used large baking potatoes; much better! 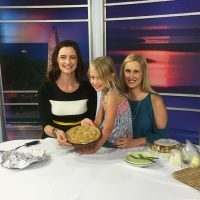 I have had my share of twice baked potatoes and I am sure you have too; these are the BEST I have ever had – no joke. The filling literally melts in your mouth. 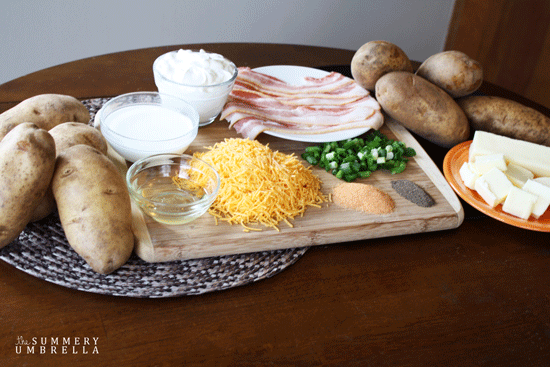 So, without further ado, let’s get started on this appetizing comfort food! 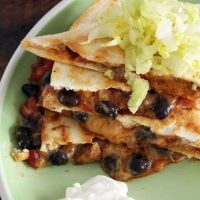 *Note: This is NOT a healthy recipe, but it is worth the calories! Always remember: portion control. First, preheat your oven to 400 degrees. 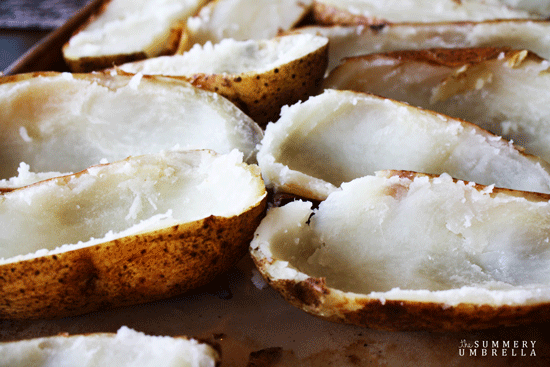 Wash your potatoes thoroughly, coat them with the oil and bake for 1 hour. While the potatoes are baking, slice the butter into pats and shred/grate your cheese (or just buy shredded cheese as a short cut). Also, fry the bacon. 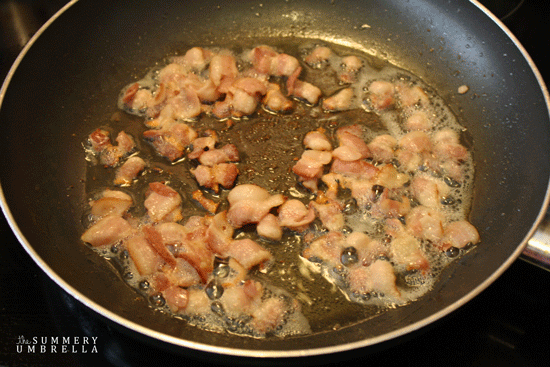 *Tip: cut the bacon into pieces with kitchen scissors (or a knife) before frying. 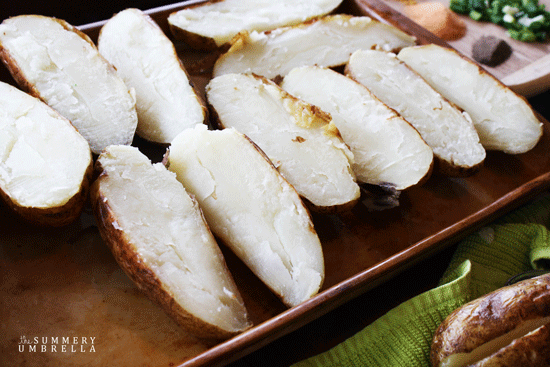 Once the potatoes are done, take them out of the oven and lower the temperature to 350 degrees. 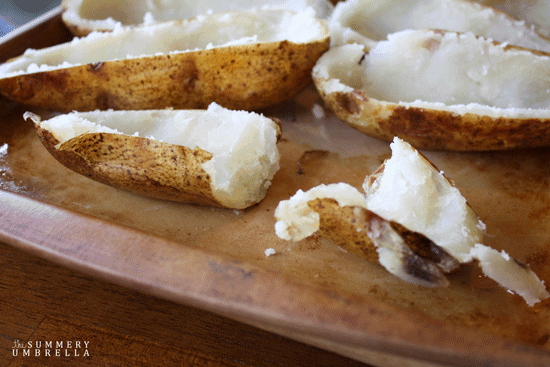 With a sharp knife, cut the potatoes in half lengthwise. *CAUTION: They will be HOT! I hold the potatoes with a towel for this and the next step. Using a spoon, carefully scrape out the insides of each potato making sure to leave a shell thick enough to hold the mixture. 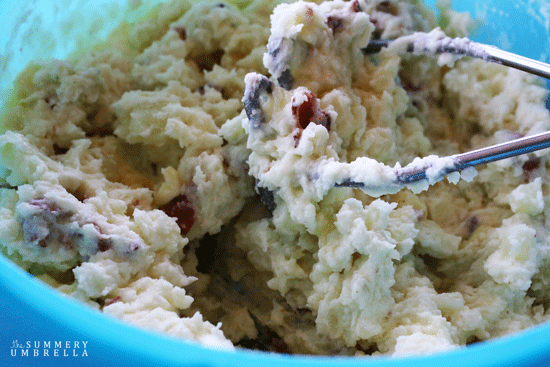 Mash the insides of the potatoes with the butter, sour cream, and bacon. Add the cheese, milk, seasoned salt, and freshly ground pepper- mix together well with a spatula or spoon. You could add green onions at this point if you so choose. *Note: the seasoned salt I have is super salty so I did not use a full 2 teaspoons, taste yours and add accordingly. Fill the potato shells with the filling so they are full and heaping. Sprinkle the top with more cheese! 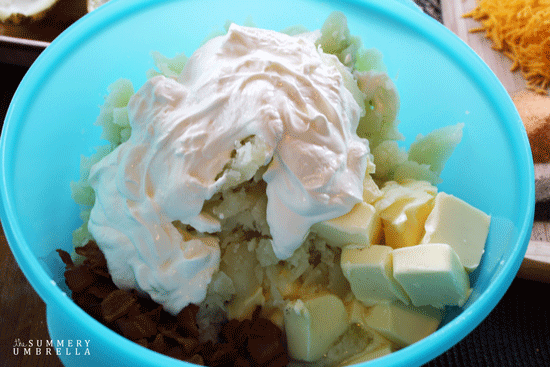 I used my Pampered Chef Stoneware bakers to hold the potatoes so they would not fall over! Put them in the oven until they are warmed through for 15-20 minutes. Once the potatoes are done, take them out and ENJOY! These look AMAZING. Seriously. Why am I reading blogs when I’m so hungry?!? Thank you for stopping by and reading even though you are starving!! :) I hope you try, you won’t regret it!